Pershing Square in downtown Los Angeles is getting a makeover – and Rem Koolhaas’ firm OMA, Morphosis, Mia Lehrer, Rios Clementi Hale, wHY Architecture, Peter Walker and James Corner Field Operations are among ten semi-finalists announced today. 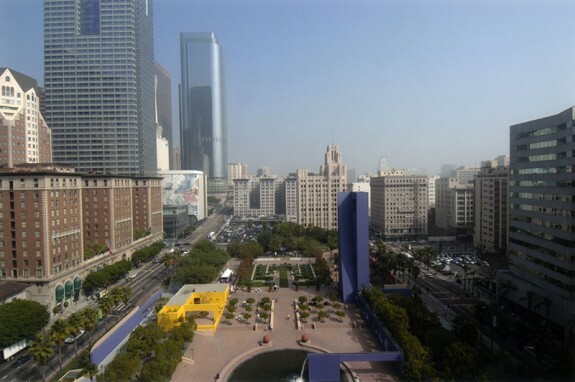 Or course this is not the first makeover for Pershing Square. It has had several since its birth in 1866. Along the way it became a formal, symmetrical park, designed by John Parkinson. Then a parking garage was put underneath it in the 1950s, and it was paved over. The most recent redesign was in the early ’90s, by Mexican architect Riccardo Legoretta. Its purple bell tower, yellow structures, fountain and a concert stage unfortunately have proven more off-putting than welcoming. The hardscape of the park has proven unwelcoming. 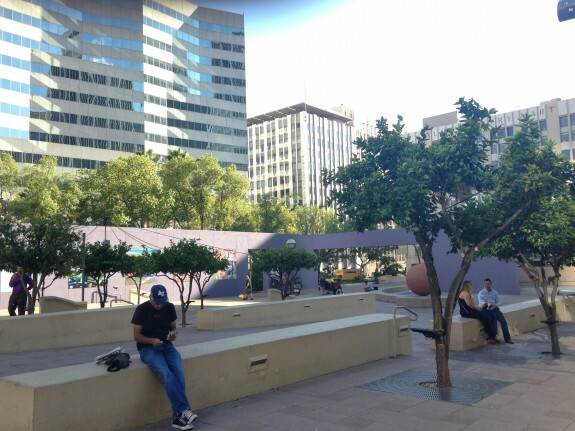 So a group of local businesspeople, community leaders and architecture firm Gensler Los Angeles, whose office is near the park, got together and set up a group called Pershing Square Renew, helmed by Councilman Jose Huizar. They secured $1 million from the Department of Recreation and Parks for immediate improvements and $1 million in seed capital from neighboring MacFarlane Partners for future improvements.They embarked on a process of public hearings and then invited multidisciplinary design teams to submit their interest. From an initial list of 54 teams, ten semi-finalists were announced today. They include James Corner Field Operations, designer of New York City’s High Line and Santa Monica’s Tongva Park; Mia Lehrer Associates, which redesigned the Natural History Museum’s gardens among many projects; Rios Clementi Hale Studios, designers of downtown’s Grand Park; Morphosis, architects of the recently completed Emerson College campus in Hollywood and downtown’s Caltrans building, in partnership with SWA Group, a global landscape architecture firm whose stateside projects include the California Academy of the Sciences. Those ten finalists will go forward and develop a “vision narrative” for Pershing Square that will be assessed in public meetings and by a private jury that includes Michael Woo, Wayne Ratkovitch, landscape architect Janet Rosenberg and Janet Marie Smith, SVP, Planning and Development, Los Angeles Dodgers. The ten teams will submit their approach and framework for re-designing the square in December. Four finalists will be picked to present to a jury and to the public in March of 2016, with a winner announced later that month. Wayne Ratkovich, President and CEO, The Ratkovich Co.